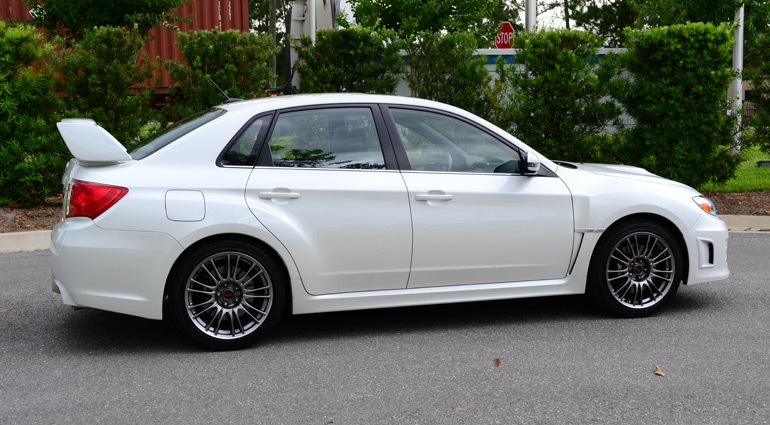 Retaining its place at the pinnacle of Subaru’s performance line-up is the new 2013 Impreza WRX STi. 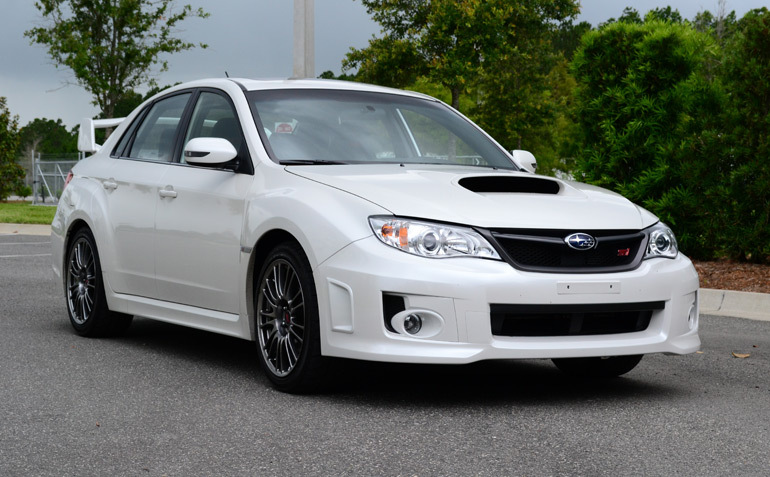 Remaining unchanged for the 2013 model year, the Subaru carries its thrilling road machine for another year with the same face, highly-praised 6-speed manual transmission and all-wheel-drive system propelled by a 305 horsepower boosted flat-4-cylinder engine. 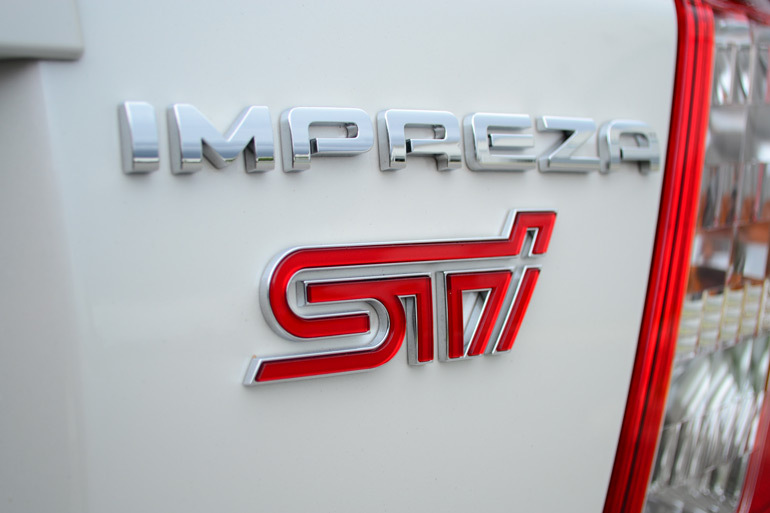 Subaru’s tradition lives on without any depart from what you expect out of the Impreza WRX STi. Drive one and you will surely think that all four wheels are on rails thanks to the remarkable limited-slip differential to manage power to the front and rear wheels. It has been a long season for the Impreza WRX STi but it has carried its age well. Many of its key traits make it a serious competitor for its class setting forth a drivetrain that is hard to beat in more ways than one. The transmission, with 6 forward gears, short-travel clutch and tight gates, give you the assurance of shifting in milliseconds. The WRX STi’s rally characteristics really shine through and beg for you to extract all 305 horsepower peaking at 6,000 rpm and 290 ft-lbs. of torque at 4,000 rpm. 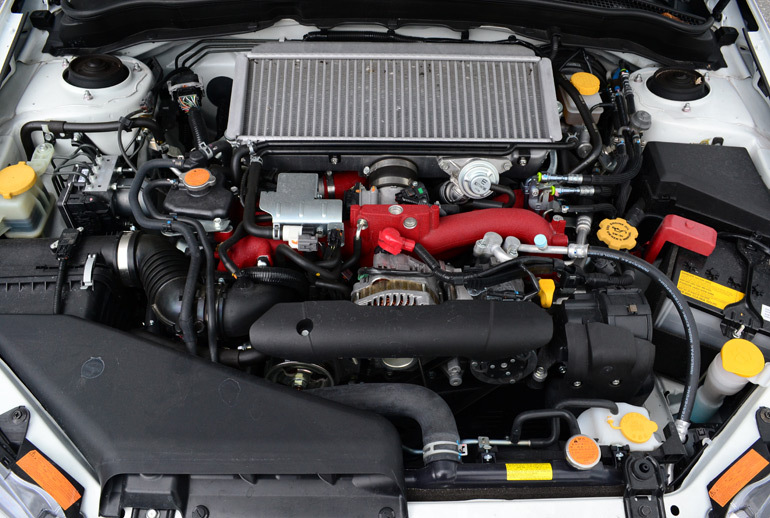 The boosted 2.5-liter flat-4-cylinder engine is unmistakable to the ear. Its unique idle and muffled purr is harmony to an enthusiast. Although, you will be pressed to drive like you stole it to really get the best bang due to such a narrow power sweet-spot. Driving the Subaru WRX STi will beckon you get the rpm needle above 4,000 rpm and below 6,000 to really get things moving quickly. It seems a bit of lag saps the fun out of the WRX STi especially when it takes an act of congress to even think about barking or breaking the tires loose. Power output is decent but comes at a price in the form of getting only 17 mpg in the city and 23 mpg on the highway. During my drive of the 2013 Subaru Impreza WRX STi Limited, I noticed the mpg figure to be somewhat inconsistent. At times I would see about 24 mpg on the highway and then it appears the ECU played some mind games at the same speed getting just 21 mpg. Around town tearing up the pavement with all four wheels biting down I could never beat 15.8 mpg. The 2013 Subaru Impreza WRX STi Limited, aside from its ride-on-rails handling, is apt to please ever-day commuters who wish to get a little dirty on weekend track days. The versatility of the WRX STi really puts the icing on the cake when it comes to boosting its value and perception on the road. Ride quality can be a bit bouncy due to the sport-tuned springs and dampers, unique to the STi model. Though, it is never too harsh at the point of being uncomfortable. 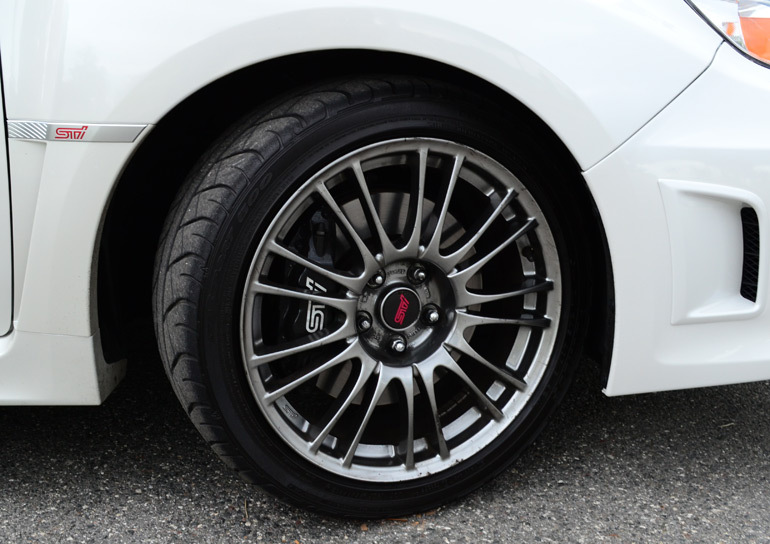 The 18-inch BBS light-weight forged wheels wrapped in 245/40 sticky large-tread-patched summer performance tires not only add a unique sporty character on the outside, but they help keep the WRX STi firmly planted in the direction that you point the steering wheel. Large Brembo brakes are a nice security blanket when you need to bring things to a stop. Even though you are not likely to upset the WRX STi laterally, it is still good to feel assured of its ability to stop in just 106 feet from 60 mph. Of course just the opposite, you will expect to reach 60 mph from a dead-stop in just 4.8 seconds. That figure allows you to hang with the big dogs costing twice the price of this 4-door AWD rally-inspired pocket-rocket. Tire spin is just about impossible, even when manually dialing-in the SI-Drive front and rear limited slip differentials, so expect that number to be rather consistent. Seating positions are ideal in the WRX STi especially having two aggressively-bolstered buckets up front. The heated front seats in my WRX STi test vehicle proved to match the versatile demeanor and its suburb handling abilities without sacrificing comfort. The interior cabin, feeling a bit aged at this point in the game, has somewhat of a raw-finished emotion to it. Of course just about every surface you will find hard plastics, some coated with colors failing to make any type of noticeable contrast. To some the interior quality and visual perception won’t matter, as it does allow the harmonious sounds from the drivetrain to flow freely into the cabin. Perhaps the interior only adds to the appeal for die-hard enthusiasts who want to extract as much of the rally traits from the WRX STi as they can on public roads and occasional track days. 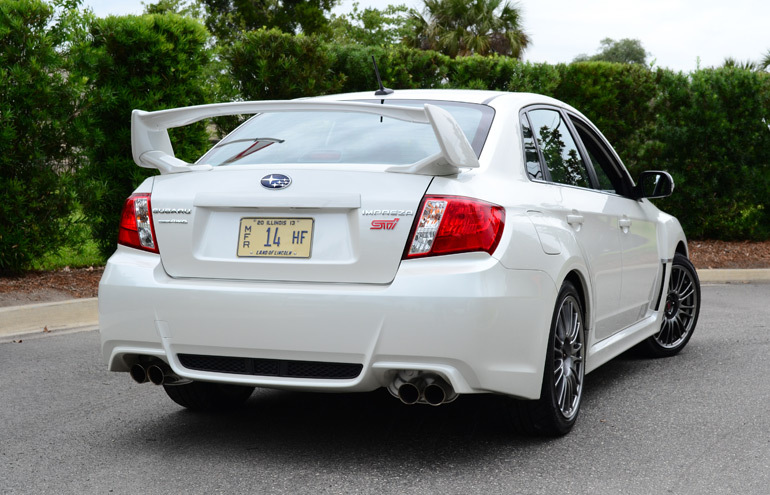 With each new model of the WRX STi, the latest generation introduction dating back to 2010 for a sedan variation brings about a new benchmark in the sport compact car segment. 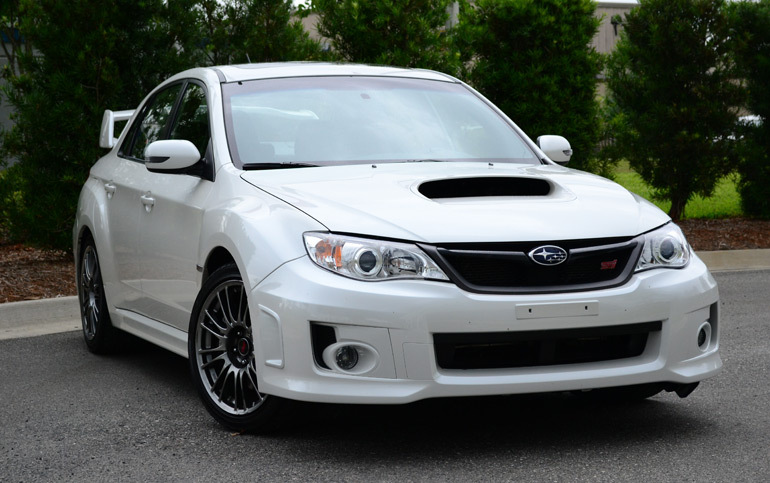 With the pricing starting at just $34,295 for a WRX STi and climbing to $37,645 for my WRX STi Limited edition, you get a good amount of raw performance for your money. Despite the Subaru Impreza WRX STi Limited still lacking interior refinement and a decent sound system, you still get the expected amenity basics like touch-screen Navigation, Satellite radio, HD Radio, Bluetooth, fog lights, HID headlights, power sunroof and awesome sport leather bucket front seats. EPA cargo volume: 11.3 cu.ft.